"Looks one step above a war zone": Comment left by a viewer of our YT video called 'Hermosa Cuenca Ecuador - Jan/Feb 2016'. War Zone? Wow, that's going a bit overboard. People who leave comments like the one above, saying that Cuenca looks like a war zone are in shock and we mean that literally. They don’t really know what it’s like to live in Latin America and they probably have never ventured very far out of their home town or city either. Wall art is not graffiti. Scribbling some angry words on a wall should not be associated with wall art; big, big difference. Graffiti can be shocking; it brings out trepidation in people because it is often associated with violence, crime and gang activity especially in hollyworld movies. The commenter is right, where there is graffiti it usually means hoodlums out at night that don’t have anything else better to do with their time. And we're not saying Cuenca doesn't have crime, but it's not as bad as some people think. Cuenca has some gangs and problems with crime but it is getting better than it used to be thanks to the much more proactive Cuenca police that are working to curb drug gangs and violence in Cuenca. The lower crime rate here could be the reason we’re seeing less graffiti on the walls as well. Yes, Cuenca has less and less graffiti on the walls just in the 7 years we’ve lived here. Now we're seeing more and more lovely wall art taking the place of graffiti. From time to time we’ll receive a comment that says something negative about the tall iron gates and barred windows on the houses in Ecuador, because it scares people; they are literally in shock. But it has to be that way, otherwise the vulnerable homes, without the bars on windows and tall iron gates will get broken into. Homes without electric fences are more vulnerable than those with electric fences in the same neighborhood. This brings us to the topic of country living in Ecuador; we’ve touched on this before. Usually homes in the country do not have the tall cement walls or gates surrounding the property, nor does the house itself have bars on the windows. And if you are a gringo living in an unprotected home you will eventually get broken into. Gated gringo communities are also targets for home invasions; having the attitude that one is protected because they are behind a security wall, invites thievery. 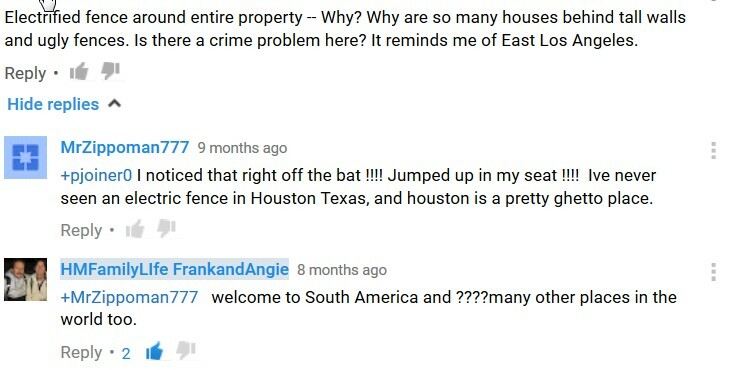 Secluding yourself within a gringo enclave tells the outsider bad apples that “you think you are better than them” and it tells them “you have something of value to take” and it tells them you believe yourself to be safer because you are living among other gringos or in a better neighborhood”. We don’t say this, the thieves think it! Well, let us tell you a little secret: more expensive neighborhoods get broken into ALL THE TIME! The gringos who are unable to live in the local standard type housing and neighborhoods, and do not blend in, will be more susceptible to being targets of crime. In a nutshell, that’s what it boils down to. This brings us back to the commenter. All we can say is these types of people maybe shouldn’t venture out of their home towns because coming here would be too shocking for them and we don’t mean that in a bad way, we’re simply being serious and honest. Lots of people come here that shouldn’t. Like mom for instance; I already know that Ecuador would not be a good fit for her in so many ways. Mom shouldn’t move here because she would want to live the way she wants, not the way she should live according to this country’s background and culture. She would not adjust very well. And if you’re moving abroad, you need to be the type that adjusts to anything. Crime Is Different in Latin America! We’ve always said on our blog to make people more aware, crime is different in Ecuador than in the U.S, which means you have to behave differently here. We’re glad we have tall gates around our home and barred windows; it’s what you need to do to protect yourself and your belongings in Latin America! Its part of life here and it’s not going to go away anytime soon! Cuenca, as a whole is a beautiful city with gracious and curious locals; it has many charms you will never find in small towns in North America of the same size and we’re happy that we are here to experience and enjoy all that Ecuador has to offer. 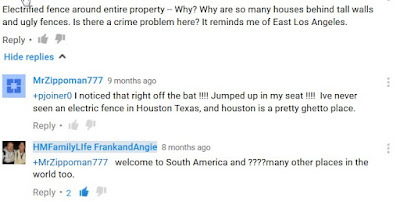 As most of you know, we live on a local level, in a local style home, in a totally Ecuadorian neighborhood, speak Spanish and blend in…and doing all that, only after four years of living here did we experience prowler/robbery problem and this was only after our home became more vulnerable, at no fault of our own! A storage structure was butted up against our detached home, which made it very easy for a prowler to use as a stepping stone to get onto our roof; from there they just climbed down into our yard. Before that for four years we had no crime issues. Until we write again…you might like these articles too. Moving to Cuenca? Should You Live in a Gringo or Ecuadorian Neighborhood? Should You Rent an Apartment or House in Cuenca? We're Italian-American expats, living frugal, healthy and happy in Ecuador for 7 plus years. Our mission is to show you what it's really like to live abroad! The postcards provide us with a dream but the reality of how it really is provides us with honesty and truth.